The SM800 sweeper will keep your premises presentable without hard work. 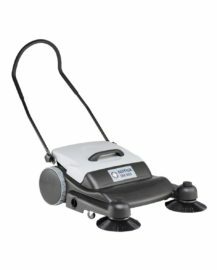 SM800 is a manually-operated sweeper ideal for limited space or congested areas. SM800 picks up paper, leaves - even small screws, nails, bolts, cans, crown corks and cigarettes, etc off outdoor spaces as well as indoor floors.